Vapor Performance Apparel Now Available! EnMart is proud to announce the addition of Vapor Performance Apparel to our product line-up. Vapor Apparel manufactures high-quality performance wear specifically engineered for the sublimation, digital decorating, screenprinting, and embroidery markets. With a multitude of sublimation friendly colors and popular garment styles, you won’t find a better garment option than Vapor Apparel. 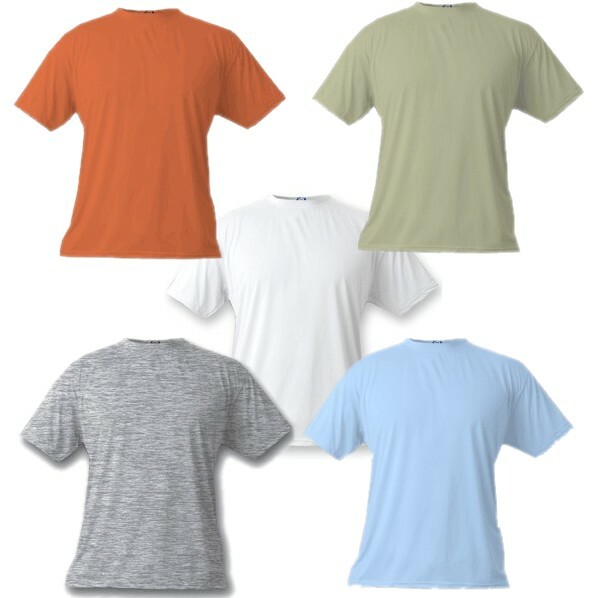 If you’re looking for a basic t-shirt to sublimate with a logo or graphic, you can’t go wrong with Vapor Apparel’s Basic Short Sleeve T-shirt. This classic t-shirt has a 5.9 oz. weight, is 100% spun polyester and offers advanced poly-performance fiber technology. This tee also delivers a look and feel even better than cotton with superior moisture wickability. It is available in white, ash heather, blizzard blue, alpine spruce and terra mesa. Those looking for a slightly more dressed up, but still classic look, might prefer the Basic Performance Polo. This is a perfect option for business casual dress, golf and other sportswear and retail outlet uniforms. Available in 5.9 oz. weight, 100% spun polyester with two-needle double-stitch split seams and four-thread over-lock hem seams. Currently offered in white, blizzard blue, sand and steel. For the ladies, who might want a slightly snugger and more feminine cut to their shirts, EnMart offers Vapor Apparel’s Ladies Classic T and Ladies Babydoll T. The Ladies Classic T has a 6.5 oz. weight and is 100% Polyester. This t-shirt features a relaxed fit with scoop neck and cap sleeves and is available in lavender and white. The Ladies Babydoll T offers a more fitted look. It comes in a 6.5 oz. weight fabric and is 93% Polyester and 7% Spandex for a stretch factor. In regards to fit, please note this style runs smaller compared to conventional cotton t-shirt sizes. For those who are interested in other items from the Vapor Apparel catalog, please note that other sizes and colors are available from EnMart but are not currently listed on our website. As always, we will entertain requests to stock additional items. Due to limited demand, other sizes and colors are currently considered “Non-Stock”, and can be special ordered by request in multiples of 6 or 36 (30 for 2XL and larger sizes).